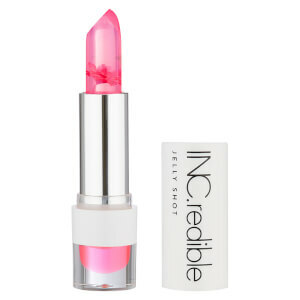 Prep and prime your lips with the INC.redible Lip Trio Gift Set You Lucky Pucker. The lip trio features a Jelly Shot Lip Quencher to deeply moisturise, an iridescent lip gloss and ruby red glitter lip topper. Create show-stopping looks for the party season. A fine glitter lip topper infused with Vitamin E to protect, nourish and moisturise. The non-sticky gloss formula can be worn over your favourite lipsticks, and provides all day, comfortable wear. A strobing lip paint that delivers beaming, high gloss results. Enriched with Castor Oil, the lip gloss glides effortlessly on, leaving lips feeling velvety smooth and flawless. A tinted, lip-quenching balm that works to prime, prep and protect your lips. Completely versatile, the balm works as a base for lip colour or post lip colour to help extend wear. Enriched with natural actives, it will enhance moisture and leave lips feeling protected. Designed with real flower set within the jelly. Lip Topper: Polybutene. Mineral Oil, Polyethylene Terephthalate, Pentaerythrityl Tetraisostearate, Hydrogenated Styrene/Isoprene Copolymer , Silica Silylate, Hydrogenated Castor Oil, Tocopheryl Acetate, Polyurethane-11, Water(Aqua), Barium Sulfate (Ci 77120). May Contain (+/-): Red 7 (Ci 15850:1), Aluminum Powder (Ci 77000), Yellow 5 (Ci 19140:1), Iron Oxide Black (Ci 77499). Lip Gloss: Polybutene, Mineral Oil, Calcium Titanium Borosilicate, Pentaerythrityl Tetraisostearate, Hydrogenated Styrene/Isoprene Copolymer, Silica Silylate, Hydrogenated Castor Oil, Tocopheryl Acetate, Tin Oxide, Water(Aqua). May Contain (+/-): Titanium Dioxide (Ci 77891), Iron Oxide Black (Ci 77499). Jelly Shot: Isononyl Isononanoate, Polybutene, Pentaerythrityl Tetraisostearate, Isostearyl Alcohol, Polybutene, Caprylic/Capric Triglyceride, Hydroxystearic Acid, Ethylhexyl Palmitate, Oryza Sativa (Rice Bran) Cera, Tocopheryl Acetate, Persea Gratissima (Avocado) Oil. (+/-) Yellow Ci 47005, Blue No.1 Ci 42090, Red No.28 Ci 45410.